Alice Through the Looking Glass is a 2016 American fantasy adventure film directed by James Bobin, written by Linda Woolverton and produced by Tim Burton. It is loosely based on Through the Looking-Glass by Lewis Carroll and is the sequel to the 2010 film Alice in Wonderland. The film stars Johnny Depp, Anne Hathaway, Mia Wasikowska, Rhys Ifans, Matt Lucas, Helena Bonham Carter and Sacha Baron Cohen, and features the voices of Stephen Fry, Michael Sheen, Timothy Spall and Alan Rickman, in his final film role. 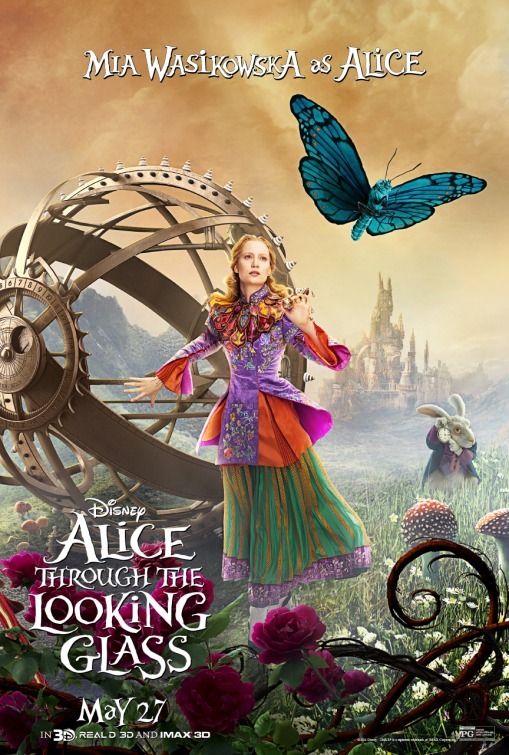 The film tells the story about Alice coming across a magical looking glass that takes her back to Underland and finds that the Mad Hatter is acting madder than usual and wants to discover the truth about his family. Alice then travels through time and comes across friends and enemies at different points of their lives and embarks on a race to save the Hatter before time runs out. This film is a tough one to review. Truly is. So I will split it into parts – storyline and everything else. The whole plot of the movie essentially ruins the plot of the first one. Now, you may think I am being dramatic but the whole White versus Red Queen war is the important element of the series – The Red Queen is our villain, and her motive was unknown and you assume it to be caused by some huge terrible event in her life and really it isn’t that terrible or scarring. But nevermind that now. What is done is done and the film has its merits outside of the plot. The visuals are – as expected – simply stunning and something amazing to see. It brings you into the whimsical world of Underland all over again, nothing is quite straight, nothing is dull, everything is bright, crisp and spectacular. Especially when compared to the real world where Alice has navigated treacherous seas using her daring it is still a much more bleak and dull colouring than Underland. This helps the contrast between the both and makes for a more visually spectacular master piece. Chessur looks amazing with his shining coat to the way he just melts into the background. The CGI to Helena and Johnny’s faces are done so well that you would almost believe that they actually looked like that. These little enhancements turn what would have been a dreadful film into something worth the watch! The acting too, is similar to the first film, Anne Hathaway plays a perfect somewhat ditzy yet composed Queen and Helena Bonham Carter is great as our prideful and rude Red Queen. Mia still portrays Alice in an almost wooden style. There is little to no expression in her body language while Johnny Depp’s depressed Mad Hatter was able to invoke feelings in the viewer that yes, he really is fading away. Sacha Baron Cohen is typically good in an idiot anti-villain. Overall this film lacks a proper direction in the plot and it suffered for it. No plot = nothing to watch and when this film appears on my TV I wouldn’t be clicking on it in a hurry. It just lacked the sparkle that the first film possessed sadly. No amount of beautiful CGI and environments can make up for what is a dud of a script.